The 2018 Chesapeake Braves completed their fourth consecutive undefeated season to run their record unbeaten streak to 104-0-1. They finished the regular season 19-0-1 with eight rain outs, as the weather was a problem all year. The Braves entered the 8-team double elimination tournament as the number one seed. After two victories the Braves were in the winner’s bracket game, producing an epic game with the Tigers. 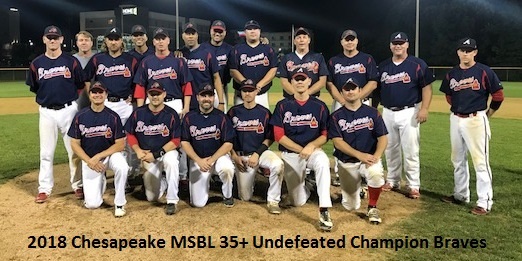 The Braves scored in the bottom of the ninth to walk off a 1-0 win behind the 1-hit pitching of Dave Greeley to advance to the championship game. The Braves faced a very good Ducks team in the championship game and found themselves down 7-5 with one out and nobody on in the bottom of the eighth. The Braves rallied for three runs in the eighth keyed by a huge 2-run double from Andy Welling to secure the 8-7 victory and the championship. Josh Molnar had an unbelievable year on the mound, surrendering only one earned run in 62 innings pitched. The Braves defense and pitching kept them in every game all year and they ended with a run differential of 229 runs scored and only 18 allowed. 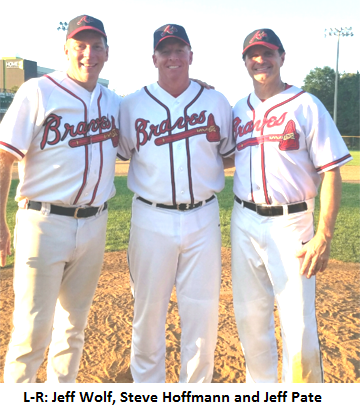 Along with Molnar, Dave Greeley, Mike Bronakoski and Steve Hoffmann spearheaded the Braves rotation. The new additions of Matt Zawisky, Mark Wittlinger, Bronson Hall, Braden Fell and Tom Foster helped solidify an already strong team. Team MVP Todd Perry and Joel Hudson had great offensive years setting the table over and over for the big bats of Ian Hendricks, Ryan Hendricks, Andy Welling and ‘BIG’ Earl Williams. Pat Conley, Jeff Pate and Howard Jones were at almost every game and played wherever was needed to help the defense and provide a spark on offense. Jason Tores had a torrid year at the plate leading the team in extra base hits and RBI’s. Kirk Peupke, Danny Lee and Jim Rice filled in whenever needed without missing a beat. Cleon Jones had another outstanding year at the plate and led the Braves in home runs. Mick Myers, along with Perry and Welling, completely shut down the oppositions running game with stellar work behind the plate. The Braves had quite a few injuries and many close games this year but somehow always found a way to pull out a victory. The Braves had a tie this year as their game with the Tigers went to extra innings ending in a 2-2 tie, which was halted by a time limit. Many people talk about the streak but every player comes to play hard every game and there is no letup. The attitudes and total love of the game by all players makes this work. There are never any problems or drama and everyone gets along like brothers! This is truly the greatest group of men and ball players that I have ever played with. We know the streak will end sometime, but we will continue to play hard and have fun!